A doctor who goes to Togo (inwest-central Africa), a school built in less than 6 months, a cultural exchange project between the elementary schools of Arona (No) and a school in Africa, an internet setup, the arrival of medical equipment and the solidarity and the desire of many people to make a meaningful contribution. And this is how, 3 years after the first trip to Togo, on July 21, 2011 Stella Onlus got started. Il Togo is a very poor country where most people live in sub-standard conditions, with inadequate medical assistance, welfare and education, where it is difficult to imagine a better future. We came to know this small country in Africa and we would like to do something, well aware that the situation will not change, but if we can help only 100 women from dying during childbirth, get 200 children off the street and into elementary school, give proper medical assistance to 100 youngsters, this in itself will be very important. All it takes is to give up a small piece of our world in order to do something important in Africa. 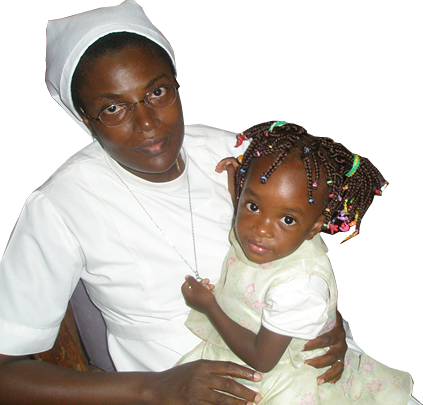 Thanks to the order of the nuns of Nôtre Dame de la Trinité, who have been working in Togo, we are sure that the funds and the equipment we send to Africa will end up where they are supposed to. Going to Togo at least once a year, we are able to keep track of the projects and focus on the priorities. "When you look up at the sky, at night, since I will be living on one of them, for you it will be as if all the stars were laughing. You, and only you, will have stars that know how to laugh!"